Halloween snackable treats, perfect for your little monsters. Looking for a fun snack for your ghouls this Halloween? Maybe you are in need of a treat for their party at school ? Here is a simple and inexpensive way to add a little touch of spooky to their snack that is sure to be a howling hit!While shopping for Halloween candy for the Trick Or Treaters we will be having this month I also picked up everything I needed to create an easy snack for my daughters Halloween school party. Werewolf, Mummy and Frankenstein Monsters. Walmart has everything you need to make these portable treats from the NABISCO Go-Paks!, Snack Pack® Pudding Cups and the Reddi Wip Original along with some fun additions if you desire. With so many varieties of the Snack Packs® and the Pudding Cups to choose from, there will sure to be a combination to please everyone. Oh and at $1 each, this classroom party will not break the bank. This is just an example of what you can use along with the base ingredients. There are even more fun and creative ways to use all the yummy snacks here! Here is what you will need and how to create them. Step 1: Open container and remove the contents of the cup leaving a couple of inches filled at the bottom. Step 2: Start layering your ingredients, pudding of choice and ready whip then adding another layer of the snacks till you are almost to the top. Step 3: Finish off with a layer of Ready whip and add toppings of your choice to create a ghoulish surprise when the cup is opened. I used , chocolate sprinkles , edible eye balls and these fun monster hands. Step 4: Open, stick a spoon in it and enjoy! I love how these turned out. The variety of flavors and toppings combos are only limited by your imagination. Feeling a bit crafty? 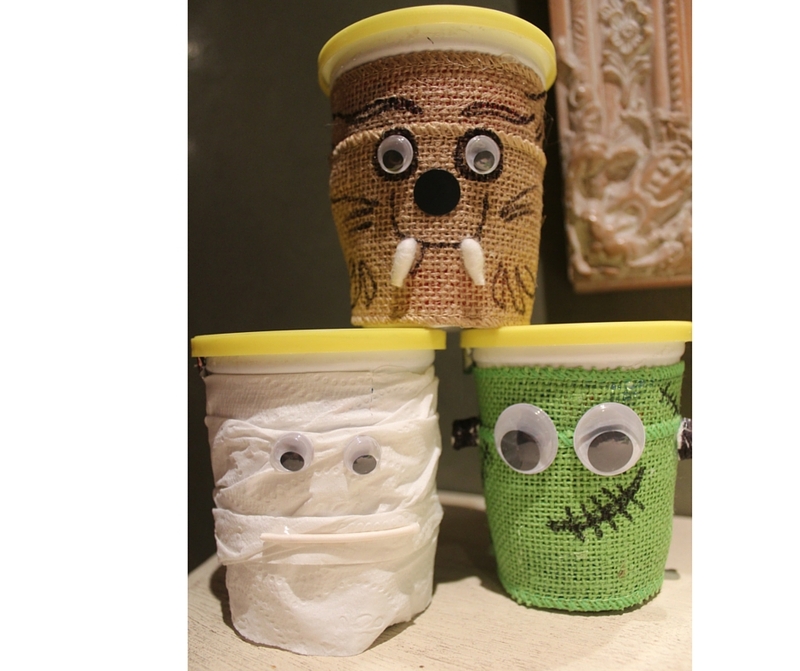 For an additional step to use at a party or for a school craft I covered the cups in friendly monsters. See instructions below and a list of what you will need. You will need gauze, scrap cloth or large width ribbon, toilet paper, Sharpie, a glue gun and Wiggle eyes. Below I did a Frankenstein one for the example. Step 1: Select covering depending on monster. Step 2: Cover Cup with desired covering adding glue to secure. Step 4: Finish off details with Sharpie marker. So what do you think, which is your favorite? Do anything special for your little monsters for Halloween? I'm Catheryn, I studied Interior Design here in LA at FIDM and am a Stay at home mom. Our Daughter is 8 years old and has Autism. I've been married for 28 years and was born and raised in So Cal. I am always out looking for new things that are “user friendly” for my high functioning spectrum girl. Occasionally you will see a review from me as it relates to those on the spectrum and the rest of the world in general with the hopes it helps a few people. Thank you So Cal Pocket Memories for having us!